The list of ingredients here is impressively short, but the technique is fiendishly difficult and needs a lot of concentration, good timing and, inevitably, a few botched attempts before you get it right. Almonds coated in a crust of crystallised sugar? Put 155g of almonds and 230g of golden caster sugar into a small frying pan with a heavy base and add about 250ml of water. Stir and heat over a medium to high heat until the sugar dissolves and the mixture starts to bubble and thicken. This will take about eight minutes or so. Eventually, the bubbles will become bigger and slower to burst. At this point, turn the heat down and stir for another minute until the mixture turns white and frothy. Pull the pan right away from the flame, leaving only the barest sliver of the underside of the pan in contact with the flame. Sugar will start to crystallise along the sides…stir the crystals back into the mixture. Keep stirring, and when crystals start to form more quickly, take the pan away from the heat completely. As you stir, and as the sugar cools, you’ll see large sugar crystals start to cling to the nuts. This will happen very quickly. When the sugar has completely turned, crank the heat up again and blast the pan for a couple of minutes to melt some of the crystals and to let them caramelise. Be careful to only let about a fifth of the crystals melt, and stir the caramel around so that it oats the nuts in a fine layer, locking in the remaining sugar crystals. Be careful here. It’s very easy to melt too many of the crystals. Quickly tip the nuts out onto a baking tray and let then cool before breaking them up into individual nuts. This is another recipe from Frank Camorra’s Movida Rustia. Delicious looking sugared almonds would be yummy paired with a fancy summer cocktail! These look fantastic! I could imagine using marcona almonds would be divine too. Thanks for sharing such a terrific recipe! I'm definitely trying this. Making a nice big batch and adding these sugared almonds to salads, on top of desserts, like ice cream or quick nibbles – perfect! Thanks for sharing this! I think it's fun to play with hot sugar – this looks like a great recipe. My family loves almonds, including my 2.5 yr old son. I must try these. Thanks for sharing. I was actually wondering what to do with some almonds I have. I have a special weakness for fiendishly short. And difficult. And delicious. Yum. I love sugared almonds, but have never tried to make them myself. I did try making toasted caramelised nuts at christmas, and they were wonderful, so I can imagine that the homemade version of sugared almonds would be pretty amazing too. Wow!!! 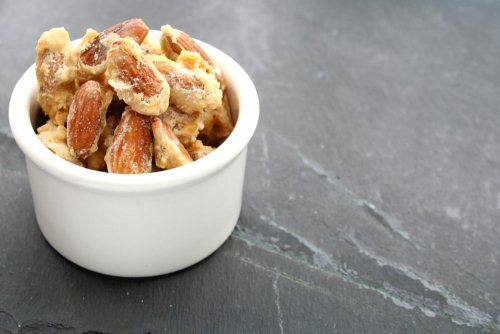 Almonds are one of my most loved flavors… sugared makes it all the more loved. Thanks for sharing. Ohh… I've been looking for a recipe like this sugared almonds for a long time and now I finally found it in your blog. 😀 Thank you so much for sharing this impressively short but great recipe. Cheers ! This totally puts a twist on my usual afternoon almond snack. Thank you for posting! There is nothing better atop a salad than sugared almonds. These really are one of my favorite treats. These sound like an amazing snack! Lovely recipe, so much so that we’re using it to make wedding favours (since it fits in well with my name, ahem). I was tempted to add a little ground sea salt at the end, during the caramelisation bit, but I’ll probably keep that for me and not risk any mods at the mo.